Energy is everywhere. It is available in abundance and seems to be unlimited as a resource. Energy is a source of currency, a form of exchange between two objects. We use it in exchange to perform a certain task or function. When boiled down, it is the basic ingredient that causes all living things to move, grow and survive. Without it we are immobile and lifeless. There are many types of energy, but the energy that I will address here is energy in how it relates to the body. I will discuss how we can tell that something is off based on how we feel. We can use the quality of our energy as a gauge to measure the quality of our health. Health is all about quality. If I could sum health up in one word that would be the word I would choose. We literally become the sum of what we give our body; but not just what we give our body; it’s the quality of what we give our body – in food, in action, in thought, in environment, in people, in every possible area. This is literally what makes us. It’s not simply what we give it, but the quality of the thing that we give it. When we do not give our body the best quality, we are compromising our health and living a less vibrant life than we are meant to live. A vibrant body cannot function optimally from pesticide laden food; hormone receptors were not meant to function with synthetic estrogen found in household cleaning or body products; cells cannot thrive on deficiencies from eating processed foods. If we want health we need to have it at the cellular level. The highest energetic transfer comes from live, high quality and nutrient dense foods. Low energetic foods are ones that are “dead”, processed and laden with artificial ingredients. Want more energy? Eat live, high quality and nutrient dense foods. The same goes for environment, thoughts, and the people you choose to interact with. Choose the best quality in every area. If you suffer with low energy, ask yourself why. What am I giving my body that is costing me my energy? Your body uses energy as a currency. Are you using more than you are giving it? Are you in debt to your body? Maybe you aren’t getting enough rest or maybe you are running around with your head cut off, full of stress and feeling drained. Stress is a huge energy drain; it uses up far more nutrients than a body at peace does. Cells are the basic foundation that builds our body. They hold and create energy and are the building blocks to which our tissues and organs are made. Our cells communicate with each other as well as give and receive signals from the environment we subject them to. If cellular health is compromised it will affect our tissues and organs that are made from them. Eventually damage can occur and then inflammation and disease develop. It is so important to protect our cells, especially the DNA that resides in the nucleus of the cell. Cellular damage occurs when the DNA is damaged by poor diet low in phytonutrients and antioxidants as well as exposure to toxins such as pesticides. All of this damage can reduce the ability of the cell to produce energy and thus affect the entire body. This is a source of stress on the body and this will in fact use up more nutrients than a body that is given healthy foods and a healthy environment. 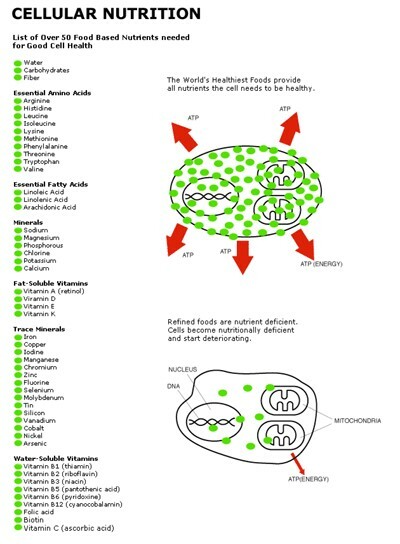 Below: What nutrients you need at the cellular level to remain healthy (taken from www.whf.com). These nutrients are found in food. The more variety of whole foods you introduce, the more likely you are to fulfill your cell’s nutrient needs. Sometimes you may need to supplement because of lack of access to food and because soil quality has diminished through the years. There are many, many signs and signals that the body can give us to indicate that something is off regarding energy. Below are some of the common issues people struggle with. Low energy in the afternoon: This usually relates to blood sugar. When we eat unbalanced meals or processed foods or too many simple sugars we have spikes in our blood sugar. While it may feel good at the beginning, we usually pay the price later in sugar crashes and low energy. The best way to avoid this is to macro-nutrient balance your meals and snacks. Eating a healthy fat (ex. avocado), complex carb (whole grains, beans, vegetables) and a protein (egg, nuts, lean meat) will do wonders for our energy levels. Sluggish feeling after dinner: This can be improved with simple good food combining practices along with good digestion habits. Decreasing water intake at meals to ½ cup at room temperature will dramatically increase proper digestion. Too much liquid with food will interfere with HCI production and enzyme function. The best foods to combine together when eating are high starch with non-starch, high protein with non-starch vegetables, and healthy oils with all types of vegetables. Poor food combining would include high protein with high starch, high protein with fruit and high starch with fruit. Fatigue: There can be many reasons for fatigue and people struggle with it to varying degrees. Some causes of fatigue can be improper sleep habits, impaired immune function, the body not properly removing toxic build up, hormone imbalance and poor digestion. These are all issues that need further looking into. Sometimes it is as easy as adjusting your diet, sleep habits and exercise levels while other times you may find that making an appointment with a professional practitioner will help get to the root cause. 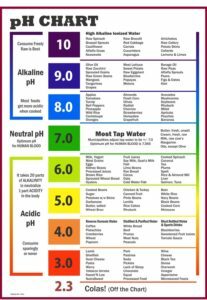 Alkaline balance: Our body functions best in a slightly alkaline state. When we eat more acid forming foods it makes our body work harder and also pulls important alkaline based minerals (calcium, phosphorus and magnesium) out of our bones, teeth and organs and into the bloodstream in order to keep the pH balance healthy. To avoid this, eat 60-80% alkaline forming foods and 20-40% acid forming foods. 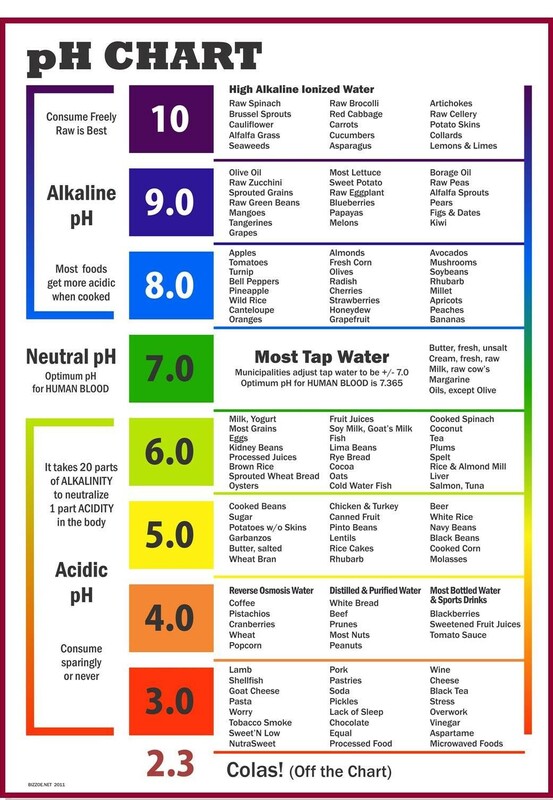 Check out the chart at the bottom to clarify which foods are more alkaline vs. acidic. Listen to your body’s cues in energy levels, make adjustments and live with the best quality of energy possible.